Around 1825 Charles S. Clarkson bought a 600-acre farm along the Miami Canal, 5 miles north of Cincinnati. He named the farm Clifton, and 500 acres of it lies within the current boundaries of Clifton, while the remaining 100 acres lies in Cumminsville. Within 5 years the farm was taken over by the Lafayette Bank and was promptly divided into 10- to 60-acre lots to be developed into summer homes for prominent wealthy Cincinnatians. Developing rapidly, Clifton incorporated as a village in 1850. Elaborate nineteenth century mansions with extensive gardens and woodlands lined Lafayette Avenue, called the "Avenue of Barons." The Sacred Heart Academy building, a school for girls on Lafayette, was erected in 1882, and is listed in the National Register for Historic Places. Mt. Storm Park, with its Temple of Love pergola, sits at the end of Lafayette Avenue and provides a stunning vista of the Mill Creek Valley. On Clifton Avenue, another historic Beaux Arts building, the 1906 Clifton School, served for many years as an elementary school for neighborhood children. The building is being renovated and now houses most of the current programs of the recently founded Clifton Cultural Arts Center. Additional programming for the Center will be housed in the Carriage House, all that remains of Alexander Macdonald's 1880s estate, demolished in the 1960s to make way for an annex to Clifton School. That annex was recently razed and a new Fairview-Clifton German Language School was erected on the site. The fountain on Clifton Avenue in front of the Clifton School/Clifton Cultural Arts Center was donated to the people of Clifton by Henry Probasco, who also donated the Tyler Davidson Fountain in downtown Cincinnati. The Clifton Avenue fountain, dedicated in 1887, is 10 feet high, and the top basin originally had a dipper to facilitate drinking. The lower basin was to water horses, and two small ground-level basins serve local dogs. 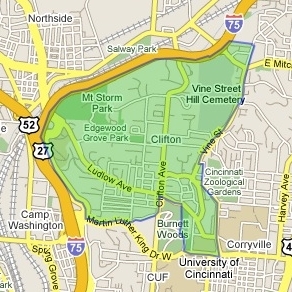 Clifton remained an exclusive residential suburb until it was annexed by the city of Cincinnati in 1896. By that time, Ludlow Avenue had become a bustling business district attracting a diverse population. Today, this area is known as the Gaslight District, as the side streets are still lit using the original gas lamps.